He Was Wearing My Harvard Tie. Can You Believe It? My Harvard Tie. Without question a large number of venerable institutions that spent most of the last several decades basking in their accomplishment, reputation and influence (not to mention affluence) have found themselves confronted with the unfamiliar sensation of ignominious defeat (or merely "substantial setback"). One could pick any number of cogent examples, but between the drubbing dealt to its endowment, and the general anti-finance, anti-Ivy (and anti-intelligentsia) sentiment that has gripped the United States, Harvard University seems to be something of a standout. But even in the midst of overt, popular ire (just look at the increasing popularity of the word "elites" as a neo-class warfare weapon for example) old and venerable institutions still have appeal. Despite the fact that the "elites" may become hated, they manage to remain deeply envied (one might even wonder after a connection therein). And so it is not remotely difficult to find oneself fielding requests for, say, letters of recommendation to these institutions. However, what, exactly, is a the author of a recommendation to make of this bit of insulting text appearing via mouseover on Harvard Business School's recommendation submission page? Of course, it is possible that this bit of text is some relic from a pizza and diet coke fueled coding marathon by some outsourced web designer who later forgot to remove it. Or perhaps this is the result of some strange data pulling error that is entirely coincidental. (The html code itself doesn't seem to contain the offending text which suggests it lurks deep within a .js file or java code somewhere or something of the sort). 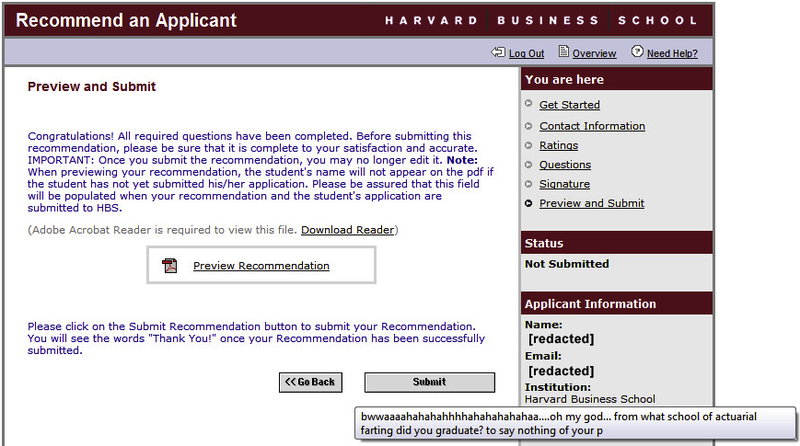 Or, perhaps, Harvard's recommendation system has been gently hacked. It does, however, seem awfully curious that this particular error should so aptly put its finger on the pulse of the sort of conceit that, rightly or wrongly, Harvard has lately become (in)famous for.